1. In a large soup pot, saute the garlic and leeks in the water. Add more water as needed until they are translucent. 2. Add the remaining water and potatoes to the pot and bring to a boil. Reduce the temperature to simmer, cover, and cook for 20 minutes or until all the potatoes are tender. 3. Use an immersion blender to blend half the liquid, leaving the other half chunky. If you don't have an immersion blender, pour half the mixture into a blender for a smoother consistency. Then pour it back into your serving bowl. Add mushrooms (I prefer portobellos for their robust flavor) after blending. Allow the mushrooms to cook for a few minutes until just softened, but still firm. 4. Sprinkle dill over the top of the soup, decorating the sides with sprigs. 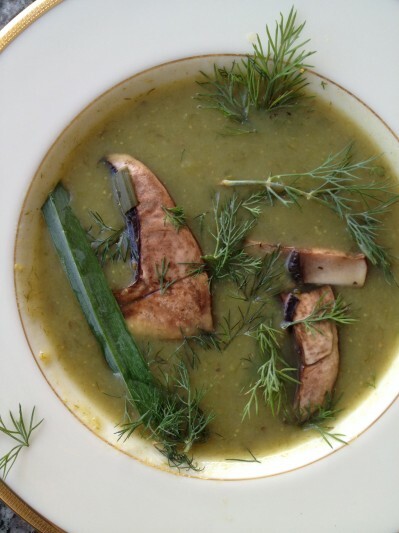 Let us know what you think of this easy vegan recipe: Mushroom Leek Soup!